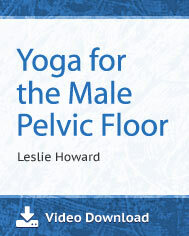 This 78-minute video download was designed for all levels of male yoga students to increase awareness, flexibility and strength of the pelvis. Everyone loses muscle strength and mobility as they get older, and because daily activities (and fitness programs) don’t usually strengthen the pelvic floor, this part of the body is particularly vulnerable to problems. As a result, many men develop pelvic issues as they get older, including incontinence, prostatitis, sexual dysfunction, and other issues rooted in the musculature of the pelvis. Although strength is important for pelvic health, posture, flexibility and deep breathing are of equal importance. This video starts with an introduction by Dr. Timothy McCall, author of Yoga as Medicine, and offers three short yoga practices to help keep the male pelvis healthy.